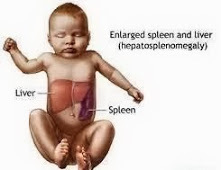 Hepatosplenomegaly is also known as enlargement of the liver and the enlargement of the spleen. Hepatosplenomegaly is caused by portal hypertension, myeloproliferative disorders such as myelofibrosis, chronic myeloid leukemia, polycythemia rubra vera and essential thrombocytopenia, lymphoproliferative disorders, cirrhosis and infective hepatitis. Patient with hepatosplenomegaly appear to be cachetic with flap and palmar erythema. Patient may also present with hand signs due to chronic liver disease ( cirrhosis). Patient may appear pale or jaundice. There will be lymphadenopathy, gynecomastia and spider nevi ( mostly due to cirrhosis). There will be dullness on the liver and the spleen. Liver is palpable from the right upper quadrant downwards and the spleen is palpable from left upper quadrant to right upper quadrant. The common investigations require are full blood count, liver enzyme, clotting studies, iron studies, abdominal ultrasound and liver biopsy.